Mini-Onken FX120 is a speaker that employs a Fostex FX120 fullrange driver. Mini-Onken FX120 has been developed by Bernd Timmermanns and David Dlugos. 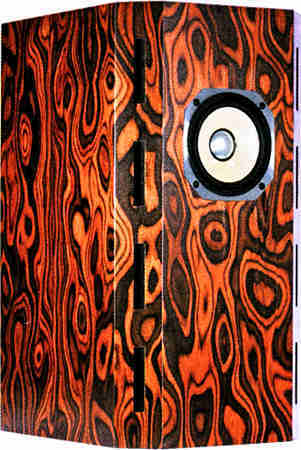 The speaker is built in onken bassreflex technology. The crossover consists of two RCL circuit in series and a RCL circuit in parallel to the fullrange driver. These are smoothing the frequency response and compensating the baffle step. Between 50 Hz and 20 kHz, the frequency response of this loudspeaker is nearly linear on axis. The decay spectrum is without big faults. At medium volume, i.e. 90 dB at 1 m, the nonlinear distortions are below 1% above 150 Hz. The high-end kit contains Clarity-Cap CMR 630 V capacitors. The coils are CFC copper foil coils and backed varnish coils for diminishing the microphonics effect. Current flowing through the coil creates a magnetic field which on itself sets the reel of wire in motion. That motion induces a voltage in the coil which adds itself to the original signal.